Long Life: Heating zones are made of stainless steel, sustain high temperature and not rust. Digital Control. Control of both the heating temperatures and conveyor speed. Three top heating zones. Max. PCB width 280mm, power consumption 5KW, IR+convection(IR generated hot air). Easy to operate, small but can make excellent PCB’s. 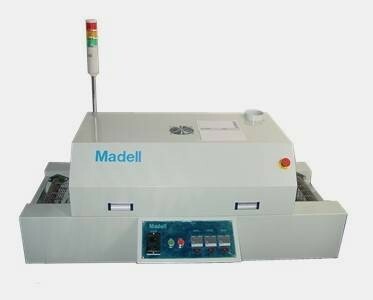 The MD series reflow ovens combine hot air with infrared to achieve even heat distribution. Infra red waveform keeps the heating chamber cleaning. Every heating zone has its own temperature sensor. It is calibrated in the factory and should not be modified. Every heating zone has its own temperature controller. It is a standard PID controller with fuzzy logic function and large driving power SSR (solid state relay). Computer, computer monitor and video monitor not included. Comes with 10 SX feeders. The new designed DP2006 has a light weight, precise and fast XYZ movement base, driven by stepper motors. Different tools can be mounted on it conveniently. The pick and place operations are the same as our other pick and place machines if computer vision is equipped. The part can be placed directly on the PCB automatically, or go through the up looking camera for precision alignment. The machine sequentially picks up taped parts from the manual feeder. The tape needs to be manually pulled forward for every 20 to 30 parts. IC’s need to be placed on flat manual feeders, pushed into a corner for positioning before they are picked up. 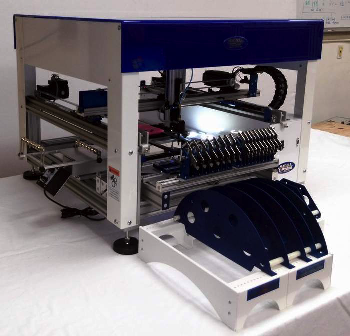 Pick and place operation can be programmed by the teaching camera, CAD file conversion, or directly moving and placing the part to a position. Click on the computer screen to set the initial position. Fine adjustments are done at testing runs. Automatic feeders, taped or stick, can also be purchased and mounted on the DP2006-2 machine. Please note that stencil printing is much faster and more suitable for fine pitch components.